Daily Devotions for Writers is the friend every writer needs: warm, real-life stories, prayers, and inspirational quotes to keep you writing every day of the year! Most writers practice their craft with a keyboard and screen and face unique writing-related fears. They work alone and face rejection with every submission. The Writing Academy, a non-profit organization founded in 1982 by Christian writers, supports beginning and published writers of all genres. 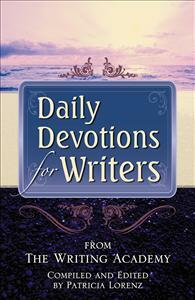 This organization formed to encourage writing excellence...During the summer of 2007, Academy member, Patricia Lorenz, suggested the group publish a book of devotions written specifically for writers...The true short stories feature author’s joys and struggles, and are specifically designed to encourage writers. Devotions include a brief illustration, prayer, and quote. For instance, Agnes Lawless, Washington, wrote about the need to submit her writing to God before writing. She used her three-year-old son’s impatience with a new toy to depict her theme. She asks the Lord to teach her, and quotes Alfred Lord Tennyson’s, “More things are wrought by prayer than this world dreams of.” ...Written for writers, by writers, these 366 daily devotions share real-life writing experiences to encourage and inspire writers to continue to hone their craft and share their writing gifts. All writers will benefit from it. It belongs on every writer’s bookshelf.